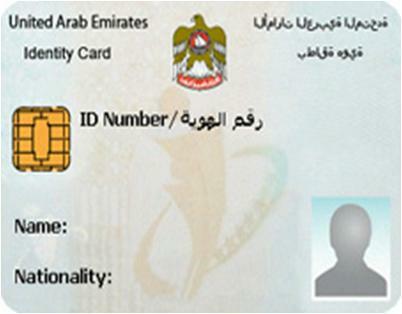 The Emirates National Identity Card, also referred as ID card, is basically identification card that is compulsory for all the United Arab Emirates (UAE) citizens and residents to have. However, it is optional for the diplomats. The age limit for Emirates ID card is 15 years and above. Getting the Emirates ID card in Dubai is a smooth process that does not require any sort of length or complicated legal procedures. Make sure to get Emirates ID card today in order to enjoy the unlimited benefits this amazing card offers during daily life activities in Dubai. Once you obtain your ID card, you will be able to prove your identity during the day to day situations within Dubai. Moreover, this unique card offers you a chance to avail the limitless services offered by the government of UAE. Your Emirates ID card is a source of your identification as per International Standards, protecting your individual identity. First of all you have to fill in the e-form by visiting your nearest authorized typing centre. Keeping your convenience in mind, about 104 registered typing centers are operating all across Dubai. Click here in order to find out about your nearest typing center. The registered typing centers in Dubai are fully equipped with all facilities and trained staff always available to help you at any point. Even then, if you find it difficult to visit the typing centers, then you can take advantage of their online facility as you are not supposed to attend to the typing center in person. Note: Make sure to fill the e-form correctly so that you can be called for the registration of the ID card. Any kind of wrong information will lead to cancellation of your request for the card. Once you fill the e-form successfully, you will receive an SMS regarding you appointment at the Service Point for the registration of the Emirates ID card. The SMS will contain the complete information, including the exact date, time and place of your appointment. You have to visit the registration centre personally with your original passport in hand in order to finalize the registration procedure of the Emirates ID card, which comprises of fingerprinting, photographing and a retina scan. However, Customer / Applicant below 15 are not required at all to go to Emirates ID service point. Note: Make sure not to have henna tattoos (non-permanent image on the skin) or to wear colored contact lenses while visiting the ID service point. Both of the situations get in the way with the fingerprinting and retina scan respectively. Secondly, the candidates (residents) should not wear official uniform or the national dress of their country, instead wear casual clothing. After completing the registration process successfully, your Emirates ID card will then be delivered to you through Emirates Post. The applicant can look forward to it for three weeks. If you do not receive your ID card within 21 days, then simply call them at 600 530 003 or visit the official website.